Doogan was a bright and budding scientist within the ranks APEX Labs who specialized in the fields of cellular biology and genetic reconstruction. He was the lead developer on the Modification Machine, a project personally financed by Max Indeks. Doogan worked closely with Belinda Giolla on the project, contributing his cellular modification expertise to her knowledge of the field of mind control. The joint effort proved to be wildly successful when their first test subject, the superheroine known as Knyght Fighter, was captured and transformed to the point of nonrecognition even by her closest friends. Her feminine physique was enhanced to what was deemed prime levels, and her personality was altered from a vigilant crimefighter into a sultry, submissive plaything. Tinker’s second subject, the petite heroine Goldwing, was an even greater success. Upon the satisfactory completion of her alterations he was promoted to director of the division of APEX which oversees the company’s various secret and illegal projects. All seemed to be going well for him until Knyght Fighter and Goldwing suddenly reverted back to their previous bodies and minds and escaped the phony lives that had been created for them. This catastrophic failure of Doogan’s invention left Max Indeks furious that his company’s time and money had apparently gone to waste. As head of the development team, Doogan was quickly made an example to his fellow employees. He was fired, disgraced, and tossed out of APEX without a penny to his name. Worse yet, his pet project was torn from his hands and re-started from scratch, denying him any credit for his years of research and hard work. Desperate to get back in Max’s good graces Doogan attempted to fix his machine’s flaws on his own, but when he was unable to procure another test subject he opted to experiment on himself. Whatever modifications he had made only made the problem worse, for his body and mind were morphed and modified to an unnatural level. 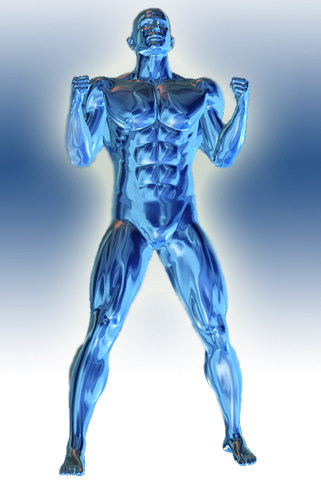 His supercharged cells became almost aqueous and he discovered he was now able to modify his entire body at will, taking nearly any form or shape he could imagine. However, the strain on his mind eventually drove Doogan to the brink of insanity and he has vowed vengeance against those responsible for his humiliation and downfall. This includes his one-time victim Goldwing as well as her Grrl Power and Superheroine Squad mates. In his quest to control his insatiable desires and fluctuating cellular structure, he sough the aid of molecular scientist extraordinaire, Virginia Havishaw. Virginia was a tad psychotic in her own right, obsessed and infatuated with experimentation and cellular genetics, and she immediately grew infatuated with the unique Doogan, to the point the two eloped and eventually were married. The twisted couple hid this from other villains, and both have no qualms about enjoying a variety of lovers, usually with one or the other watching or joining in. Changeling’s physiology is in a constant state of flux, more liquid than solid. With concentration, he can modify his genetic structure at will, taking the form of anything his imagination can conjure up. This enables him to flawlessly impersonate any man or women he wishes to resemble, as well as to form his body into shapes or weapons necessary for a given situation. However, the strain of trying to control every cell in his body means Changeling often attempts to replicate forms he is most familiar with.